Spring has Sprung (ok it says so on my calendar). While it’s true here where I live in Canada I am still under a blanket of snow that doesn’t mean I’m not getting excited to decorate for Spring. 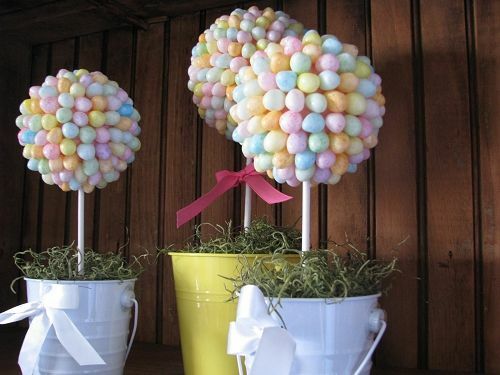 For some reason when I think about Spring decorating,Easter bunnies pop into my head. 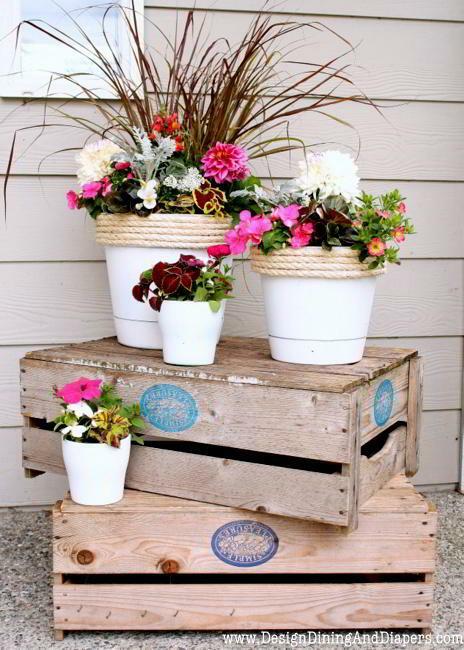 I was searching around on the internet to give me some ideas to transform my now blah looking front porch. I found some ideas that I loved and hope you will too. Is this not adorable or what?? 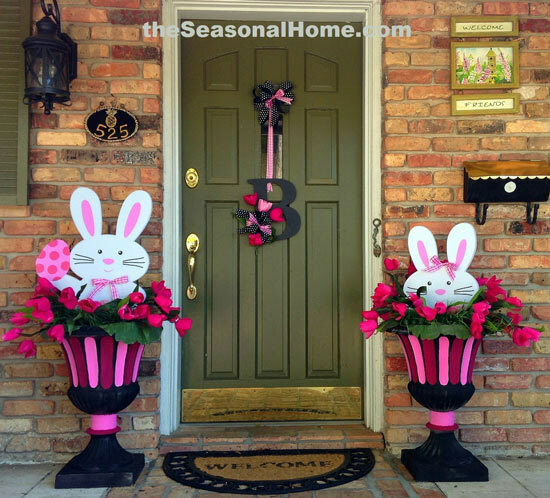 Look at those giant bunnies – check out all of her fabulous decorating ideas at the Seasonal Home. 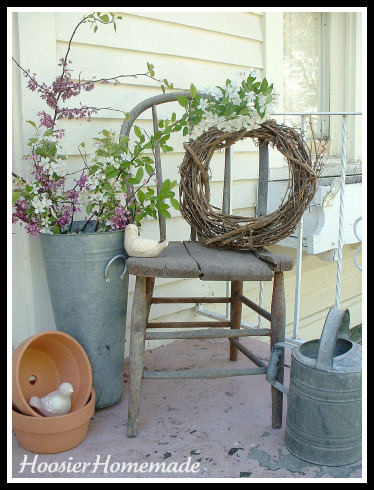 Forsythia always signals Spring to me and when I saw this wreath in a bucket, it got me to thinking I might be able to pull this off……maybe – ok I don’t have a table to use but I do have an old chair…..hmmmm. Check out the full post here. 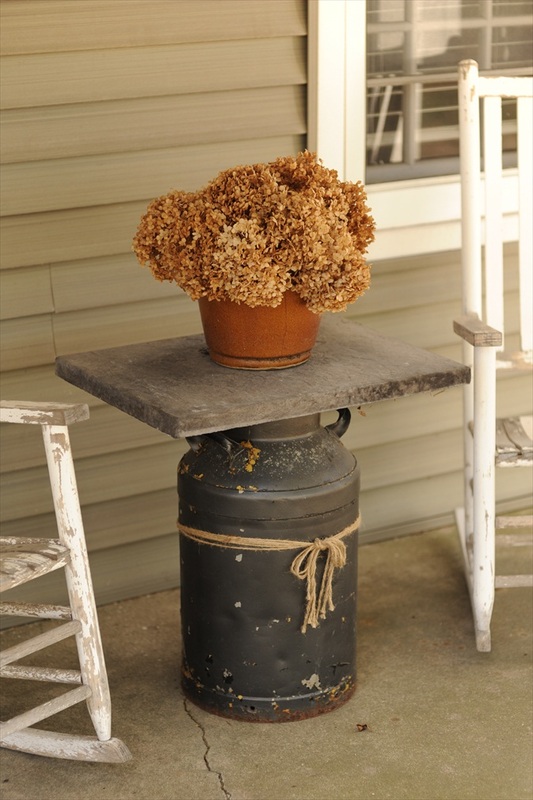 This Vintage inspired porch decor is simply awe inspiring – there is more to see check it out here. The next two on the list I think I might be capable of…so many to chose from. I always enjoy what Hoosier Handmade is up to. 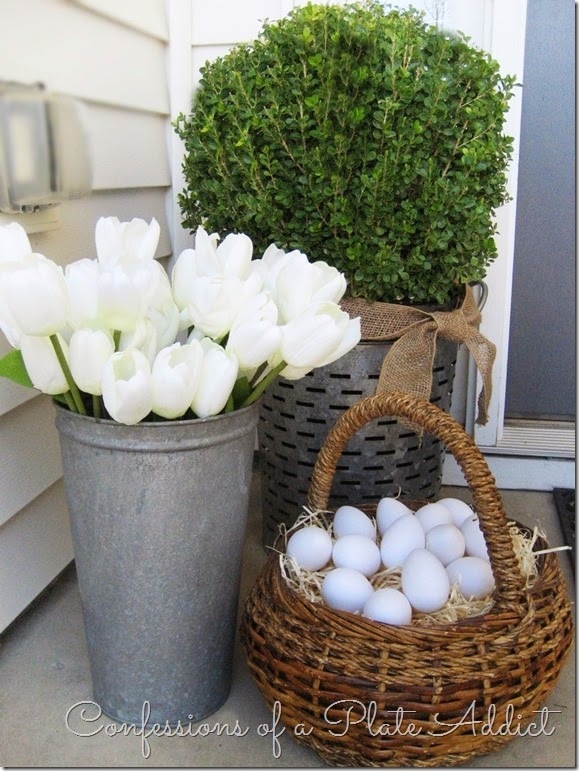 This next one is pretty simple – if I go this route my tulips will have to be fake, at least until end of May. See the original here. I really like this next idea and it would transition nicely into Summer. It would also solve my lack of house number issue. Simple illustrated instructions as well. Found on Listotic. The simplicity of this one is a statement in itself. It’s from Sidewalk Ready. Can you believe it was her first time decorating her porch (Design Dining and Diapers)? I think it’s fantastic and worth a try. The idea at the top of the page was found on Pinterest but when I tried to click into the post I got a message that said “not available”. If this is your picture or you know who owns it, please email me so that I can give credit where credit is due. 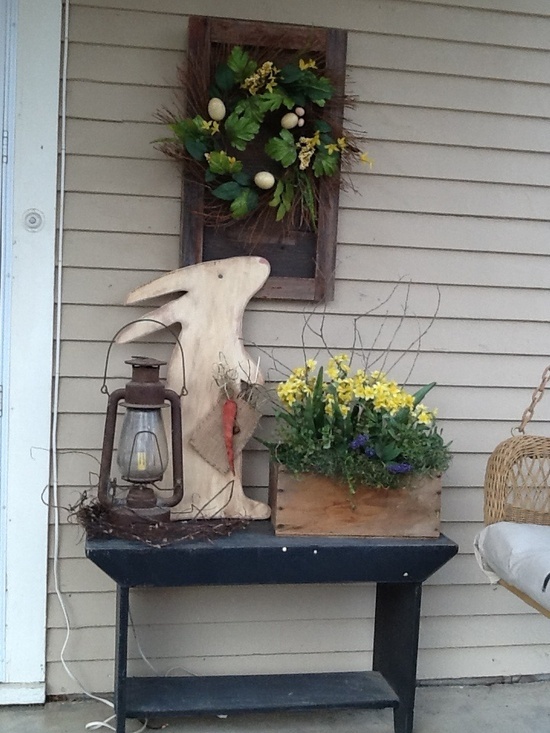 Spring porch decorating – It’s A Wandaful Thing! 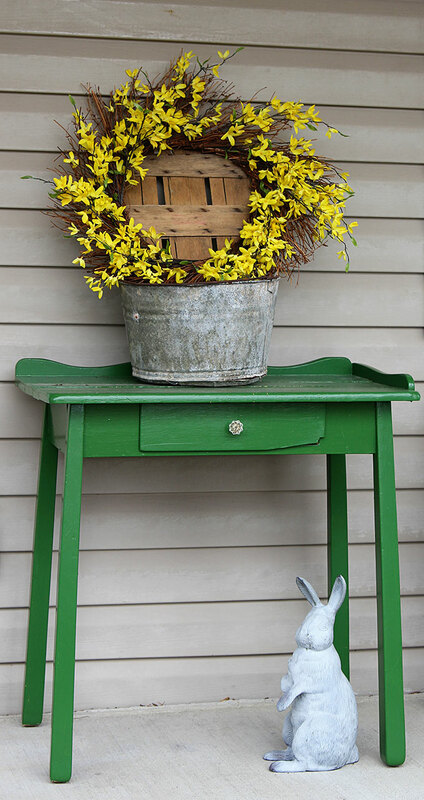 This entry was posted in Decorate, DIY and tagged antique, bucket, chair, Crafts, creativity, Decorate, decorating, DIY, easter, easy, happy, inexpensive, living, make, paint, porch, recycle, ribbon, simple, Spring, tulips, vintage, wood. Bookmark the permalink. As someone who works part-time in a vintage shop, these ideas are inspirations. Thanks and Happy Spring. I could only dream to work in a vintage shop….lucky you!! I bet see lots of great items. They are all great idea. 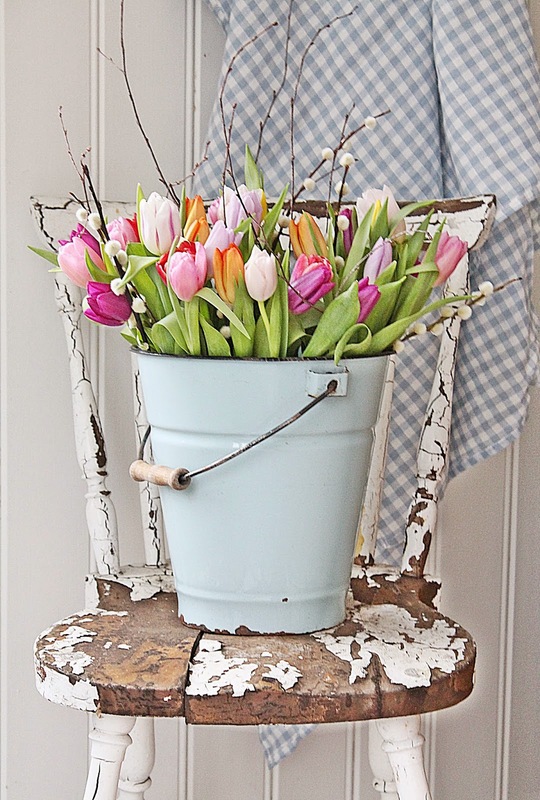 I love the tulips in the white bucket on the old chair.